Max is a two year old Chocolate Lab / German Shorthair Pointer mix. Max’s owner called me to help him get over his extreme fear of the kennel. According to his owner, Max started out crate-trained but after moving to a new location and living arrangement, he developed an intense fear of the kennel; destroying several and injuring himself in the process. Usually when Im called in to help a dog get over a fear of the kennel its due to the way the dog is introduced to a kennel. Usually the dog is put into the kennel by force and as soon as its inside, the human’s leave giving the dog two issues to deal with; confinement and isolation. This is why you should never force a dog into a kennel and why its important for the dog to practice bing calm in the kennel with his humans home and in the same room. This gives the dog practice at being inside a kennel and that familiarity helps the dog stay calm. When I arrived for the session, Max was excited, but not out of control. However his constant pacing gave me pause so I asked his owner what rules, limitations and boundaries he was expected to follow. While some dogs can get along well without any rules, the more determined and high energy breeds (Like labs and German Shorthair Pointers) do much better when their owners practice exercise, discipline, rules and structure. When Max’s owner told me he didn’t really have any rules, I decided to start there. I suggested a few easy boundaries and rules to incorporate to help Max see his owner as someone in a leadership position. Consistently following and enforcing rules and boundaries is a great way to help a strong willed breed of dog learn to assume a follower position. Next I opened the kennel door and then tossed in a few high value treats from across the room. This caused max to cycle the room several times looking for any way to get the treats without going into the kennel. I explained to his owner that it was important that he did this in his time so we sat quietly and watched as Max worked up the courage to get the treats. Max very hesitantly darted his head into the kennel and gobbled up the treat closest to the kennel for then lurched away from the kennel. After circling the room again, he approached the kennel and stuck his head in a little further to get the next treat. He repeated this process, slowly gong further inside the kennel each time until he was finally retrieving the treats in the very back. As he progressed though this, his hesitation to enter the kennel slowly dissipated with each treat recovered. Once he was entering the kennel with little hesitation, I tossed in another treat but this time followed behind him so that I was standing in the doorway to the kennel blocking him from exiting. Max tried to push past me at first, then stood in place. Once he did I slowly took a step back then paused and waited for Max’s reaction. Because he stayed in place, I took another small step back, then paused again. I repeated this process until I was standing a few feet away. When Max tried to exit, I quickly moved back into the blocking position, then repeated moving away one step at a time. At no point did I close the door to the kennel as I wanted Max to relax. 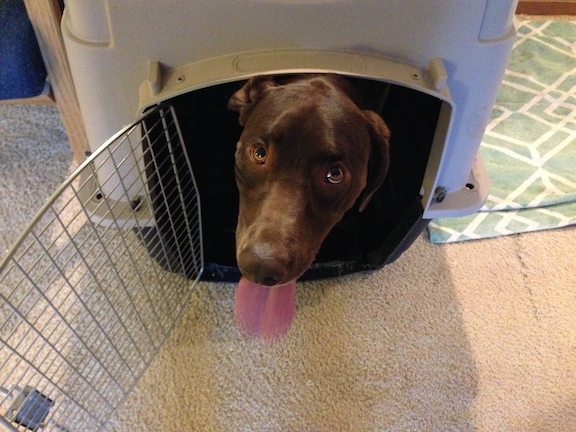 For dogs with a fear of the kennel, closing the door is often more than they can take. Once I was about eight feet from the kennel, the waiting game began. You can’t force a dog to change behavior. They have to do it on their own time table, so there I stood for nearly an hour. Max’s breathing became labored as staying inside one his own was difficult and taxing. After an hour, fatigue started to set in. Max moved to the back of the kennel to lean against the back wall. After another ten minutes, he started to droop a bit and eventually he laid down. As soon as Max laid down, I dropped to a knee and immediately gave him permission to come out. I rewarded him with a tasty treat, lots of petting and praise. The first time is always the hardest. Max’s owner will need to repeat this process several times until Max starts to lie down sooner and sooner – each time getting permission to exit as soon as he is laying down. By repeating this process, Max will learn that being in the kennel does not mean his owner is leaving and that nothing bad happens when he is inside. With practice, Max will build up confidence of being inside the kennel until he gets to the point where the fear is gone completely.